Springfield, Peoria, Lima. These are hallowed grounds in any longtime fl at track fan’s world; racing venues that have been on the American Flat Track schedule so long that each of those facilities could be considered Mecca for most people. 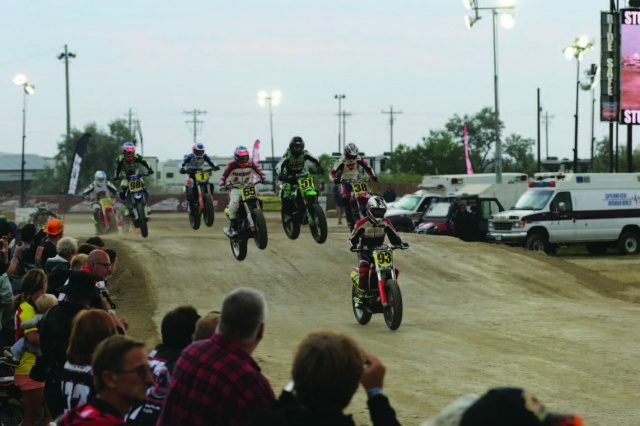 Peoria is the longest continually running national and the stars of the sport soar through the central Illinois skies each August in their quest to step where very few have before, the top spot of the box just under the scoring tower. As I type this out, I’m on my way to the 100th running of the Springfi eld Mile. If Peoria is the Fenway Park of our sport, Springfi eld is the Hollywood Walk of Fame. Mile Masters such as Scotty Parker, Kenny Coolbeth and most recently Bryan Smith have S etched their name on the Randy Turbett trophy multiple times, but it’s also played host to some of the most improbable fi nishes in history, such as privateer racers like Willie McCoy, Brandon Robinson, and just last spring, Illinois’ own, Jeffery Carver. Lima has its own character. It’s deep; loose limestone base brings out some of the grittiest rides a racer may ever have. Multi-time champion Jared Mees has been tough to beat here recently, but from the farmlands of Quebec came Dominic Beaulac for an insane runaway win in 2006. He promptly went back to Canada and hopped back on his combine after the race from what I’m told. These are the venues, racing surfaces and most importantly, racers of legend. With all of that said, there’s a wind of change afoot. 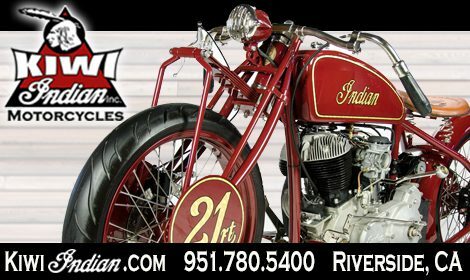 Ask any fl at track racer worth the weight of their steel show what a “Grand Slam” is, and they won’t mention baseball. 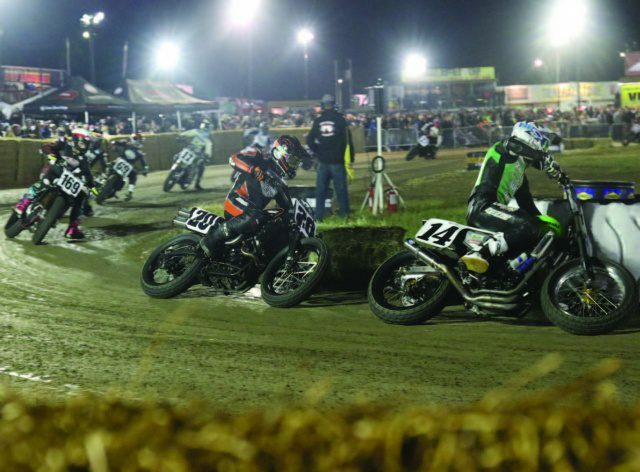 It’s the rare feat of winning a Short Track, TT, Half-Mile and Mile race during your career. It’s much harder than it sounds. There are certainly specialists. For instance, Henry Wiles, though second in points at the time of this writing, he’s known as the current master of TT races. Kenny Coolbeth and Bryan Smith are the Magicians of the Miles, though recently Jared Mees has shown that he has the moves to win anywhere, any time. What about you though? You may like fl at track, but what can you accomplish from your side of the fence? You know South Dakota. Home to the Black Hills and a little rally you may or may not have heard of before. But just outside of the Sturgis city limits is the “city” of Buffalo Chip. 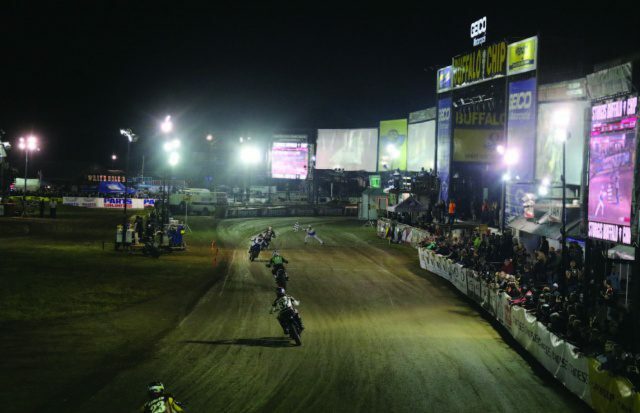 The Buffalo Chip is home to The Best Party Anywhere™ and is a yearly pilgrimage for a lot of people to enjoy concerts, bike shows, and at times, a tinge of good ole American adult debauchery. 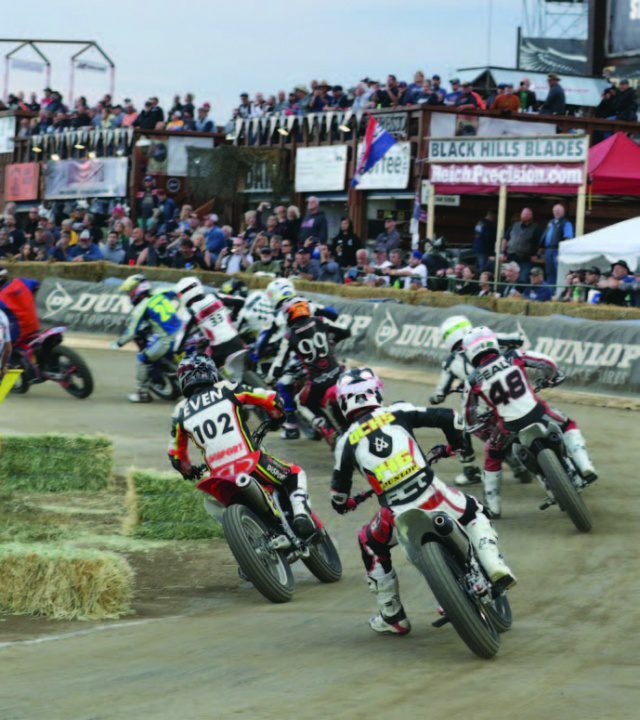 In 2017 however, management decided to host a round of the American Flat Track series after dabbling in the counterculture Hooligan series. I had my doubts going to the race in 2017. Flat track is important to me. It’s the sole reason I work in the motorcycle industry. It’s given me my greatest triumphs and harshest defeats. I’ve seen the sport take the lives and limbs of some of my closest friends, so in my more serious view of the sport, I was afraid things would turn out to be a joke. I’ve never been more wrong. If you read my story a few months ago encouraging you to make your trip to Springfi eld, you realize that a race is more than just a race. It’s a culture; it’s a lifestyle. There’s no other place to see lifestyle and culture on display than the Legendary Buffalo Chip. Top that off with the best fl at track racers in the world and a track that literally wraps itself in and out of the crowd? Are you kidding me? This completes my “Grand Slam” of races to see. The Buffalo Chip TT is the only race I believe in the history of the sport to ever have spectators that accidentally showed up. Think about it. If you’ve attended a fl at track race, you saw it advertised, you went out of your way to ride there, and you bought a ticket. Not so much at the Buffalo Chip. You could be one of many of the thousands of campers there. Maybe you were having a few cocktails at Bikini Beach, and you wanted to stumble over to the zip line for a peek of the amphitheater. Maybe you needed a brisket sandwich from the vendors over that way. You make tracks to the land of beer, lights, and scantily clad females and all of a sudden; there’s a Harley XG750 fl ying through the air. The sights, sounds and smells coming from everything from the sizzling exhausts to the smoldering brakes is as intoxicating as that 16th Bud Light you’re holding in your hand. In 2017 we saw Briar Bauman break a lot of hearts by taking the race win on his Zanotti Racing Kawasaki. This year we saw Jake Johnson snap a long-time winless streak to run away from the best in the business. 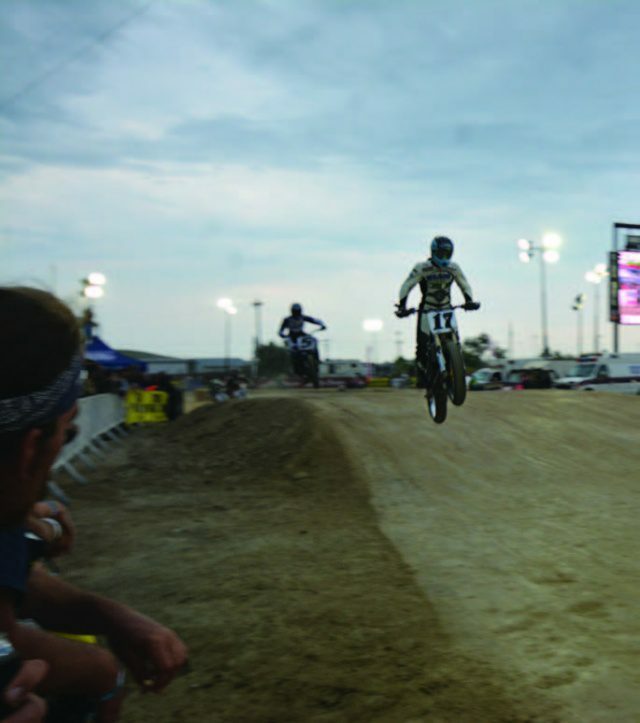 From the serious fan like myself to the person who doesn’t understand why Jeremy McGrath and Evel Knievel aren’t there racing with them, this venue provides something for people on all levels. The pits are mostly open, the racetrack is set in the middle of a rock concert, and you know what, when the track is “cold” (no bikes on it) you can still take a trip on the zip line. On December 31st you’re going to be sitting around thinking about how to make your life more complete for 2019. May I suggest hopping on that motorcycle and completing my new spectators “Grand Slam” of venues? You’ll only be on the road late May through e arly August to hit them all, but the stories will last a lifetime. There’s no better family than the fl at track family. 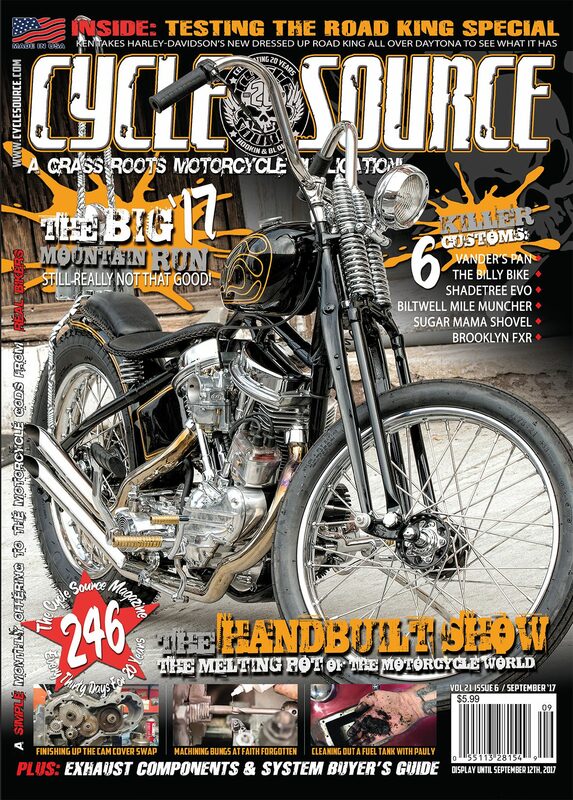 Get out there and support the greatest motorcycle show on earth. This entry was posted in Races and tagged Back Issue, Cycle Source, Cycle Source Magazine, Events, Grand Slam, InSLIDE Line, November 2018, racing. Bookmark the permalink.